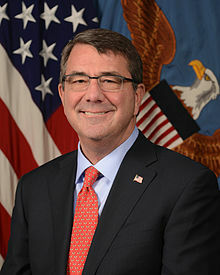 Ashton Baldwin "Ash" Carter (born September 24, 1954) is the former United States Secretary of Defense. He is also a physicist and a former Harvard University professor of Science and International Affairs. He was nominated by President Barack Obama, and confirmed by the Senate by a vote of 93–5, to replace Chuck Hagel as the US Secretary of Defense. ↑ Cooper, Helene; Sanger, David E.; Landler, Mark (December 5, 2014). "In Ashton Carter, Nominee for Defense Secretary, a Change in Direction". The New York Times. Retrieved February 5, 2015. This page was last changed on 30 August 2017, at 21:13.